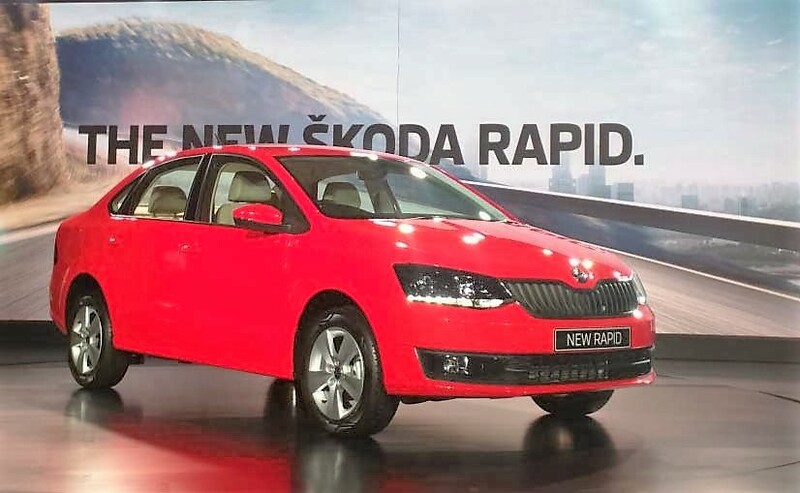 New Skoda Rapid facelift has been launched in India with a price tag of INR 8.27 lakh (Ex-showroom, Delhi) in Active, Ambition and Style variants. Price for the base petrol variant starts at INR 8.27 Lakh and touches 11.36 lakh (Ex-showroom, Delhi). On the other hand, the diesel base starts at INR 9.48 lakh to 12.67 lakh (Ex-showroom, Delhi). Other small changes include ORVM now gets turn indicators, chrome boot lid and trapezoidal fog lamps. Side profile remains similar to the pre-facelift model. Interiors are now finished in new dual tone black and beige colour combination with some changes to the equipment on offer. Rapid facelift comes equipped with cruise control, rain sensing wipers, auto fold ORVM, new 6.5-inch mirror link touchscreen infotainment system with Bluetooth and GPS navigation. Other changes include AmberGlow footwell illumination, leatherette lined armrest and chrome decor. On the safety front, ABS and dual front airbags are part of standard equipment. Upgraded 1.5l TDi powertrain is borrowed from the recently launched VW Ameo with improved power and torque figures of 108bhp and 250Nm of torque mated to a 5-speed manual and 7 speed DSG gearbox. The petrol engine has been carried over without any change and churns out 103 bhp and 153 Nm of torque mated to a 5-speed manual and 6-speed Tiptronic gearbox.